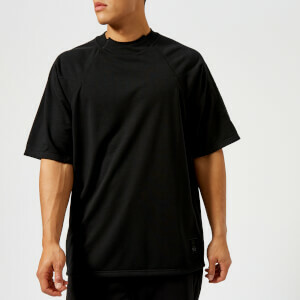 Men's short sleeve Y-3 T-shirt; designed in collaboration with adidas and Japanese fashion designer, Yohji Yamamoto. Cut from stretch Climalite fabric with sweat-wicking properties, the slim fit '3-Stripes' tee showcases a minimalist design enhanced by signature adidias qualities. Features a ribbed crew neck, set-in raglan sleeves and matte rubber 3-stripe design down the sides that fades into a pigment print. Finished with a straight hem and Y-3 logo to the back.